Gus is Special Kinda Madness’ official mascot. He has over 300 likes on his Facebook page, pushing 200 followers on Twitter, and a growing Instagram account. He has proved himself to be a very a popular part of Special Kinda Madness. Gus currently resides in Ruislip, Middlesex. Well, it’s all a big mystery really. I was actually pulled out of a skip by our lead singer, Darren, with all my tags still in place. What was the first Special Kinda Madness gig you attended? Halifax on September 14th, 2013 is still probably my favourite ever. Just remembering the fantastic light show, the crowd and lots of smoke. A real baptism of fire for me. Plus the show was run by Gorilla Zoo Promotions, so I felt right at home there. Do you ever get nervous at gigs? Not really. That would be very unprofessional. It’s all part of the job to be cool, calm and collected. I must admit it’s no cake walk sometimes. I’m always up front so I get all the beer spillages. Had some nasty moments too. Being hurled 70 feet across a crowded dance floor in Norfolk was not good. It’s all part of the job though, and I love it. Madness, Specials, Bad Manners, and all the 2-Tone bands. Plus I like the early ska, of course. I like a lot of other music too. I often get asked to share or retweet posts on social media. Don’t mind doing that at all. I have never bought into that rival band thing. There’s a lot of great stuff being played out there. The Rockets and RPMs are my favourites at the moment. There are so many. The obvious things like the buzz of being on stage, the atmophere and the music the guys produce. I think the best is when I’ve assumed my position on stage at the beginning of the night, and I watch all the fans come in and smile at me. That is the best thing for me – making people happy. Thanks, Gus. Keep up the good work with the band! 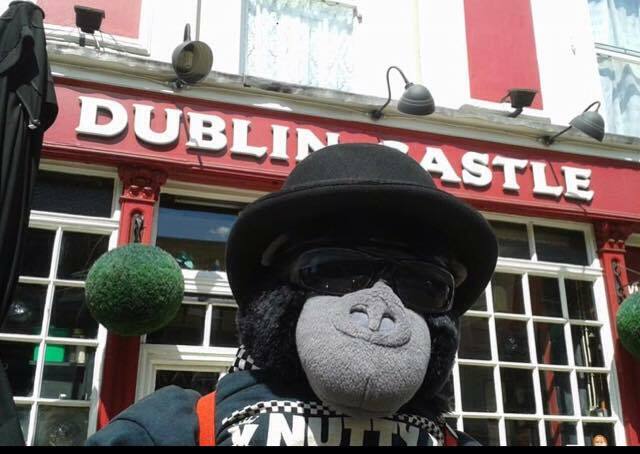 Keep in touch with Gus The Ska Gorilla on Facebook, Twitter and Instagram.